A spicy Mexican condiment which is a mixture of pumpkin seeds (pepitas), ground nuts and sesame seeds, tomatillos, green chile peppers (typically poblano or serrano), spices, soybean oils, bread or crackers (wheat flour and corn starch), sugar, and other seasonings. This condiment or sauce has a delicate flavor that is mildly spicy, depending on the seasonings added. 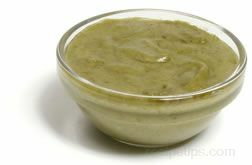 Mole Verde paste, made from the ingredients, is often mixed with water or a chicken broth (1 part Mole to 4 parts water/broth) before being heated to be served as a sauce to flavor poultry, seafood, pork, or vegetables. A spicier version of mole is also available, known as Mole Rojo or red Mole, which is served with food dishes, such as chicken or pork, eggs or egg dishes, enchiladas, rice, refried beans, or tamales.